Before cutting, fold the paper in half along where the first cut will be. Unfold and fold in half the other way. Unfold. Now use the folds to guide your cuts. 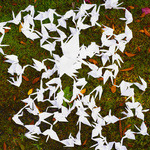 The first pattern produces a ring of cranes. Cut a + through the paper, leaving a margin at the edges. It's like making paper snowflakes. 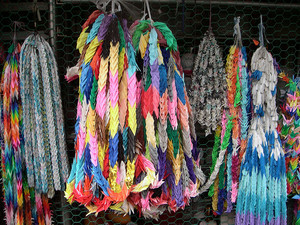 The second pattern produces cranes all connected to a central point. 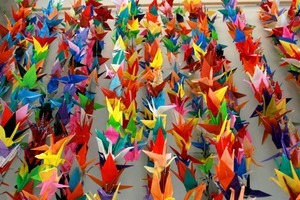 The less margin you leave, the more fragile the connection between the cranes will be, but the more elegant and easy to fold. Now each of the four squares can be folded into an individual crane, with the edges (and thus the cranes) remaining connected. To make cranes connected by their wingtips, make sure that when you fold the wings up (before folding in the edges of the head and tail), that their points are the ones connected to the adjacent squares of paper, and the points which will become the head and tail are not connected. To connect them head-to-tail, do the opposite. This is not a good technique to use if you plan on folding a lot of cranes, unless storage space isn't an issue. 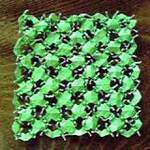 For that, I recommend folding them in the normal way, but do not fold their wings down in the final step. This makes them much easier to store, string, hang, and transport. You can always fold the wings down later if you'd like. 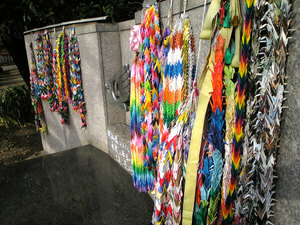 A lot of "thousand cranes" at weddings, it seems. I wasn't aware of this phenomenon.